There are a variety of options for BRCA positive people, and even more will be on the way with new findings. Stay tuned for posts about some of the latest research. If you personally have had no history of cancer, yet are worried about your family history (see list in previous post http://amyappell.com/2017/07/brca-101/), then it’s time to speak with your Primary Care doctor who may refer you to a Genetic Counselor for a consultation. Of course, you can always decided not to get tested after your appointment, yet it can be helpful to get all of the information possible. It’s challenging to say when the right time is to get tested for a BRCA gene mutation; it’s a very personal decision, which may end up being that you choose not to get genetically tested. I was one of those people, yet ended up saying yes to the test. As much as I didn’t want to know, I needed to know, when my sister suddenly decided to get tested. 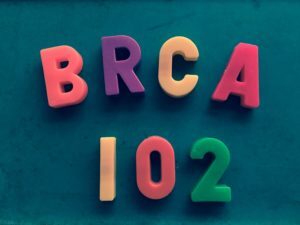 It turned out that we were both positive for the BRCA2 genetic mutation, yet we were grateful that it came at a time when we were finished having children. It is completely understandable for women to want to have their children first, without the looming pressure of possible prophylactic surgeries, continual monitoring appointments or added worry. However, there can be some risk reduction in developing various cancers when action is taken before certain ages. For instance, we were told that a prophylactic oophorectomy, removal of tubes and ovaries, before the age of 35 has been found to reduce your chance of breast cancer by up to 50%. Of course, statistics can always change and this one is already being challenged as false. If you ask women who developed cancer in their 30s or 40s before getting BRCA tested, they will tell you that they wish they had known. Whether to test or not, along with when to is so complicated, that it is completely a personal decision that no one can make for you. For breasts, it is recommended to alternate between a mammogram (3D if available) and MRI every 6 months. I originally encouraged my mother to get tested, so that I could get breast MRIs covered by insurance when I turned 40. For melanoma risk, a visit to a Dermatologist annually is helpful in early detection. My husband, who lost his mother to this highly preventable cancer would highly recommend this action. You can choose to focus on improving your lifestyle by making it a healthier one. Improving one’s way of eating, de-stressing, sleeping and moving all have a tremendous impact on disease prevention. Some people refer to this as “doing nothing” in the cancer prevention world; however, I really don’t see not taking care of oneself as an option, especially being in a higher disease risk category. The whole premise of my website Bloom with Bliss is all about living in joyful wellness, so stay tuned for updates and helpful links to help you live a healthier, happier life no matter what diagnosis/disease you have, or desire to prevent. For breast cancer prevention, you can opt for prophylactic bilateral mastectomy (PBM), where almost all of the breast tissue is removed. While it doesn’t guarantee that you will never develop breast cancer, it does bring you into very low risk at about 5% (although the number has increased over the years). This news was highly disappointing to me when I was considering surgery and then I discovered why there was no guarantee. http://www.nationalbreastcancer.org/breast-anatomy describes it as: “The female breast is mostly made up of a collection of fat cells called adipose tissue. This tissue extends from the collarbone down to the underarm and across to the middle of the rib cage.” Thus, it’s a large area to clean out and microscopic cells can get away. For ovarian cancer prevention, there is the bilateral supingal oophorectomy (BSO) where tubes and ovaries are removed. Some women also opt for their uterus, called a hysterectomy, and cervix to be removed, yet those are only recommended in certain cases. A newer procedure called a salpingectomy is helping women feel that they have reduced their ovarian cancer risk, while still maintaining their hormones. Only the tubes are removed, yet ultimately, the ovaries get removed closer to menopause or after child-bearing years. There is not enough research on this procedure to say how well it prevents ovarian cancer, although it often begins in the Fallopian tubes. Note: There are more preventative measures that are being researched like pharmaceutical drug usage called “Chemoprevention”, and a possible future vaccine. I will report on them as they move beyond the experimental research phase. If you choose a prophylactic bilateral mastectomy (PBM), there are a few ways that you can reconstruct your breasts. Implants have come a long way toward being safer. Silicone implants tend to be firmer than saline and are often necessary because of the removed layer of fat cells along the entire chest wall. However, some surgeons use the saline ones. Implants can be round or tear-shaped and can be placed under the chest wall or over. The protocols range from DTI, direct to implant, surgeries to expanders being placed first to allow stretching of the muscles and skin before a follow-up surgery called the “exchange” when the actual implants are inserted. What other questions do you have about the prevention of BRCA-related cancers?